Now you have another option to manage product changes for your customers with a new feature: Delayed Product Change. This allows you to bypass proration concerns in a smart way by telling Chargify to schedule the product change to the subscription’s next renewal date. Before, both options available to move a customer from one product to another performed the change instantly, either calculating proration on the spot or skipping proration completely. 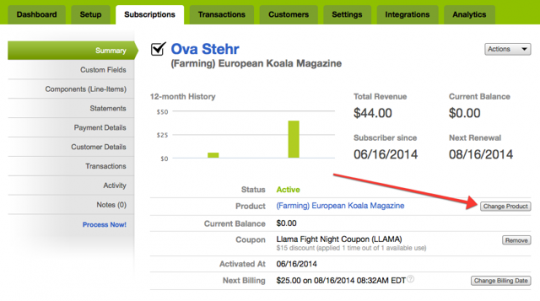 But, by using Delayed Product Change, you can let us do the change automatically when the subscription renews. That way, you don’t need to worry about proration since your customer will be charged for a full period on the previous product and will start off a fresh period already on the new product. And, our Web interface and API will continue to reflect the old product until the renewal. This can reduce confusion for customers who have downgraded, but expect to see and receive the benefits of their current plan until the renewal date. 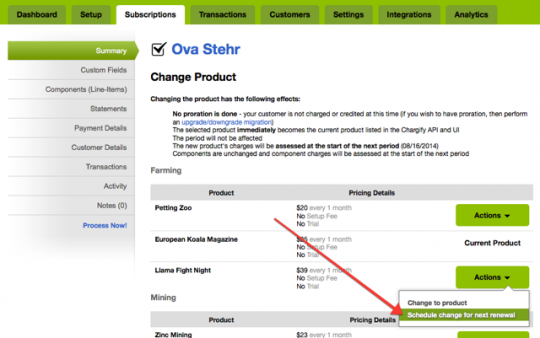 You begin as you normally would for a regular product change, by clicking on the “Product Change” button in the Subscription details page. The only difference is that, instead of choosing the “Change to product” option, you’ll choose “Schedule change for next renewal”. Voilà! You’ll instantly see a reminder letting you know that your product change has been scheduled and allowing you to cancel it at any time. If you need a more complete guide, you can refer to our documentation on the three ways to change products in Chargify. We hope you enjoy this new way of making your customers’ lives easier!